First up: the well heeled: the heels have been turned on the second Tottering Cable and Lohengrin socks. I think the TC sock should be finished shortly, making it the first finished pair of 2010...maybe this weekend if I'm lucky! 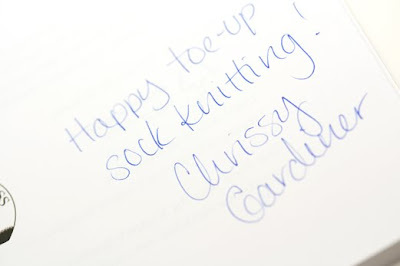 I'm delighted to tell you that Chrissy Gardiner is going to stop by We Heart Yarn during the blog book tour of her book "Toe-Up!" on Monday February 1st, that's next Monday! Chrissy is a very talented designer, and boy are we lucky to have her reside in PDX! 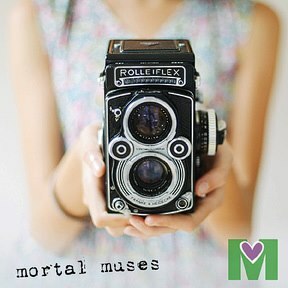 I hope you'll be able to stop by and join in the fun on Monday!! I'd like to invite you to leave questions in the comments of this post for Chrissy to answer. I'll pass the questions on to Chrissy so she can incorporate some of them into her post. I have an autographed copy of her book to give to one lucky person who leaves a question here...so start thinking of some questions and I'll figure out how to randomly pick a winner!! ETA: I'll be closing the comments with Friday morning's post. Thank you for all your great questions!! This sounds fun! I've yet to try making a sock from the toe up so I'd be glad to know the best (or easiest) methods for beginners to use. Having just learned how to knit my first socks, from the top down, I would like to know: What are the advantages of knitting toe-up? I'm a dedicated toe-up sock knitter and have been for numerous pairs. 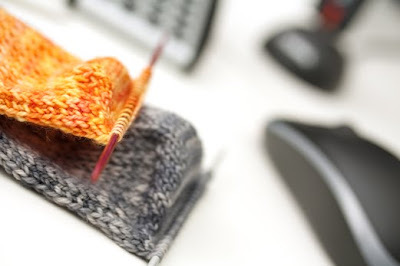 Toe-up sock patterns vary greatly in the number of gusset increases used to make a heel flap. I'm having a hard time figuring out why some patterns only add about 20 stitches while others add up to 50% of the total stitch count. Can you give a few guidelines for determining this number? I'm with WingedStrategos - I'd like to know more about strategies and techniques for heel-flap heels in toe-up socks. I love your book and would adore a signed copy. Even if I dont win, if I sent a copy to you in a self addressed stamped envelope, would you sign it and drop in the mail? Oh how neat! 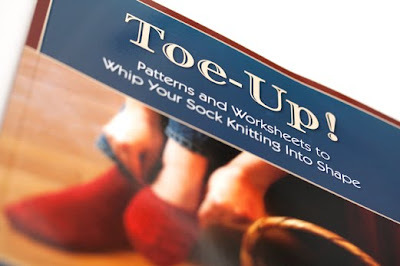 I usually do a toe patteren off the web, nice to see there is a book on now too. The problem I alway encounter is the sock slips down and clumps into your boot(great description isn't it)and sometimes the castoff on the ribbing is either too loose or too tight. - I will most definitly show up on monday with bells on. Chrissy, do you design the pattern to fit the yarn or pick the yarn after to fit the pattern? Thanks for the opportunity to win the book! For some unfathomable reason, it is not yet on my bookshelf! fingers crossed for the patterns and pretty pictures!!!! Would love to learn to knit a pair of socks. Is the toe up method easier? Whatever is easier is what I'd like to do first. I had no trouble with my first toe up sock, but it doesn't fit well. I'm not sure how I can make the toe to heel portion more elastic. Thanks. I have a wide heel, what would be the best heel for a toe-up sock? Does your book offer more than the regular short row and wrap heel that always leaves me with holes and a feeling that that heel won't last as long? I've read a few patterns that do it, but it's not sinking in up top! Taught myself to knit top down 1st then toe up so it can't be all me...no it just couldn't be!